Barrington Stage Company’s 2013 season schedules lists some 275 events. Plays featured on BSC stages in 2013 include On the Town, music by Leonard Bernstein, book and lyrics by Betty Comden and Adolph Green, The Chosen, by Chaim Potok, adapted by Chaim Potok and Aaron Posner; Much Ado About Nothing, by William Shakespeare, starring Christopher Innvar, Gretchen Egolf, and Mark H. Dold; Clybourne Park by Bruce Norris. Also on tap is the world premiere of Scott and Hem In The Garden of Allah, written and directed by Mark St. Germain. The play is about the artistic and romantic rivalry between F. Scott Fitzgerald and Ernest Hemingway. May 22 – June 8. BASHIR LAZHAR by Evelyn de la Cheneliere, translation by Morwyn Brebner. Directed by Shakina Nayfack. American premiere. This timely and beautifully written play about a French-Algerian refugee inspired the Oscar-nominated film Monsieur Lazhar. St. Germain Stage at the Sydelle and Lee Blatt Performing Arts Center, 36 Linden Street, Pittsfield. Performances Tuesday-Saturday at 7:30pm, Saturday at 4pm, Sunday at 3pm. Additional matinee Thursday, June 6 at 4pm. Press Opening: Sunday, May 26 at 3pm. Tickets: $40-$46. Tickets to performances May 22 & 23 are $15. Seniors: $32 all matinees. Youth ages 6-18, tickets $15 all performances (subject to availability). May 28. Post-Show Discussion: BASHIR LAZHAR. St. Germain Stage the Sydelle and Lee Blatt Performing Arts Center, 36 Linden Street, Pittsfield. Following the Tuesday 7:30pm performance. June 1 – 2. WE MADE THAT: THE SONGS OF MILLER & TYSEN. The songwriting team who wrote The Burnt Part Boys and The Mysteries of Harris Burdick for the Musical Theatre Lab, perform tunes from those shows and from their new musical Tuck Everlasting. June 1 at 9:30pm and June 2 at 8pm. Tickets are $25, general admission. Mr. Finn’s Cabaret at the Sydelle and Lee Blatt Performing Arts Center, 36 Linden Street, Pittsfield. June 8 – 9. TONYA PINKINS IN HURRICANE ETHEL: THE LIFE AND TIMES OF ETHEL WATERS. Tony winner Tonya Pinkins. June 8 at 9:30pm and June 9 at 8pm. Tickets are $35, general admission. Mr. Finn’s Cabaret at the Sydelle and Lee Blatt Performing Arts Center, 36 Linden Street, Pittsfield. June 12 – July 13. ON THE TOWN, music by Leonard Bernstein, book and lyrics by Betty Comden and Adolph Green, directed by John Rando and choreographed by Joshua Bergasse. A New York City musical comedy bursting with high energy dancing, not to be missed!. Boyd-Quinson Mainstage, 30 Union Street, Pittsfield. Performances Tuesday and Wednesday at 7pm, Thursday-Saturday at 8pm, Wednesday and Friday matinees at 2pm (excluding 6/12, 6/14 and 6/19), Sunday at 5pm. Please note Thursday, July 4 there is no 8pm evening performance; will be a 2pm matinee. Press Opening: Sunday, June 16 at 5pm. Tickets: $20-$65. Performances June 12-14 tickets are $15/$20. Seniors: $39 & $34 all matinees. Youth ages 6-18, tickets $15 all performances (subject to availability). June 13 – July 6. MUCKRAKERS by Zayd Dohrn, directed by Giovanna Sardelli. A political and psychological thriller about secrecy and privacy in the modern world. St. Germain Stage at the Sydelle and Lee Blatt Performing Arts Center, 36 Linden Street, Pittsfield. Performances Tuesday-Saturday at 7:30pm, Saturday at 4pm, Sunday at 3pm. (Additional matinees on Thursday, June 27 and July 4 at 4pm). No 7:30pm performance on July 4. Press Opening: Wednesday, June 19 at 7:30pm. Tickets: $40-$46. Seniors: $32 all matinees. Low priced previews June 13 & 14 are $15. Youth ages 6-18, tickets $15 all performances (subject to availability). June 18. Post Show Discussion: ON THE TOWN. Boyd-Quinson Mainstage, 30 Union Street, Pittsfield. Following the Tuesday 7pm performance. June 20. Post-Show Discussion: MUCKRAKERS. St. Germain Stage the Sydelle and Lee Blatt Performing Arts Center, 36 Linden Street, Pittsfield. Following the Tuesday 7:30pm performance. June 22. BSC ANNUAL SUMMER GALA featuring a performance of ON THE TOWN at 4pm at the Mainstage, 30 Union Street, Pittsfield. Followed by a spectacular party with dinner, dancing and a silent auction at St. Joseph’s High School, 22 Maplewood Ave, Pittsfield, as Barrington Stage celebrates Pittsfield educator and visionary Shirley Edgerton. June 29. UP CLOSE with the cast of ON THE TOWN. June 29 at 10:30pm. Tickets are $15, general admission. Mr. Finn’s Cabaret at the Sydelle and Lee Blatt Performing Arts Center, 36 Linden Street, Pittsfield. June 30 – July 1. Paul Green and the Jewish Jazz Project: Traditional Klezmer Favorites and Jewish Jazz Fusion. June 30 and July 1 at 8pm. Tickets are $25, general admission. Mr. Finn’s Cabaret at the Sydelle and Lee Blatt Performing Arts Center, 36 Linden Street, Pittsfield. July 6 – 7. Mr. Finn and his All-Star Songwriters, Take #1. July 6 at 9pm and July 7 at 8pm. Tickets are $20, general admission. Mr. Finn’s Cabaret at the Sydelle and Lee Blatt Performing Arts Center, 36 Linden Street, Pittsfield. July 8. LINDA LAVIN “Possibilities” with Billy Stritch on piano. Boyd-Quinson Mainstage, 30 Union Street, Pittsfield, 8pm. Tickets: $75 VIP seating includes post-show reception with Ms. Lavin; $45, $35. July 9. Musical Theatre Apprentice Cabaret. 10pm. Tickets are $10, general admission. Mr. Finn’s Cabaret at the Sydelle and Lee Blatt Performing Arts Center, 36 Linden Street, Pittsfield. July 14 – 15. SIBLING REVELRY with ANN HAMPTON CALLAWAY and LIZ CALLAWAY. 8pm. Tickets $45, general admission. Mr. Finn’s Cabaret at the Sydelle and Lee Blatt Performing Arts Center, 36 Linden Street, Pittsfield. July 16. Gutless and Grateful: A Musical Feast with Amy Oestreicher. 8pm. Tickets are $20, general admission. Mr. Finn’s Cabaret at the Sydelle and Lee Blatt Performing Arts Center, 36 Linden Street, Pittsfield. July 18 – August 3. THE CHOSEN by Chaim Potok; adapted by Chaim Potok and Aaron Posner. Directed by Aaron Posner. The much-beloved story of two boys, two fathers, and two very different Jewish communities in Brooklyn during World War II. Boyd-Quinson Mainstage, 30 Union Street, Pittsfield. Performances Tuesday and Wednesday at 7pm, Thursday-Saturday at 8pm, Wednesday and Friday matinees at 2pm (excluding 7/19), Sunday at 5pm. Press Opening: Sunday, July 21 at 5pm. Tickets: $20-$58. Performances July 18-20 tickets are $15/$20. Seniors: $39 & $34 all matinees. Youth ages 6-18, tickets $15 all performances (subject to availability). music by Julianne Wick-Davis, book and lyrics by Dan Collins, starring Jeff McCarthy and Annette O’Toole, directed by Tom Caruso. St. Germain Stage at the Sydelle and Lee Blatt Performing Arts Center, 36 Linden Street, Pittsfield. A new musical about transformation, love and redefining family. Performances Tuesday-Friday at 7:30pm, Saturday at 4pm and 8pm, Sunday at 3pm. Press Opening: Wednesday, July 24 at 7:30pm. Tickets: $40-$46. Tickets to performances July 19 & 20 are $15. Seniors: $32 all matinees. Youth ages 6-18, tickets $15 all performances (subject to availability). July 23. Post-Show Discussion: THE CHOSEN. Boyd-Quinson Mainstage, 30 Union Street, Pittsfield. Following the Tuesday 7pm performance. July 24 – August 11. BSC’s Youth Theatre presents Disney’s THE LITTLE MERMAID JR. Directed and choreographed by Christine O’Grady. At Berkshire Museum, 39 South Street, Pittsfield. Performances Wednesday-Friday at 7pm, Matinees Wednesday and Thursday at 2pm (excl. 7/24); Saturday at 10am and 3pm; Sunday at 3pm (additional Monday matinee July 29 at 1pm). Tickets: $8-$15. A Museum/Theatre Pass is available for $25 (adults) and $13 (youth). July 27 – 28. JOE ICONIS & FAMILY. July 27 at 10:30pm and July 28 at 8pm. Tickets are $25, general admission. Mr. Finn’s Cabaret at the Sydelle and Lee Blatt Performing Arts Center, 36 Linden Street, Pittsfield. July 31. Post-Show Discussion: SOUTHERN COMFORT. St. Germain Stage at the Sydelle and Lee Blatt Performing Arts Center, 36 Linden Street, Pittsfield. Following the Wednesday 7:30pm performance. August 3. UP CLOSE with the cast of SOUTHERN COMFORT. 10:30pm. Tickets are $15, general admission. Mr. Finn’s Cabaret at the Sydelle and Lee Blatt Performing Arts Center, 36 Linden Street, Pittsfield. August 8 – 25. MUCH ADO ABOUT NOTHING by William Shakespeare, starring Christopher Innvar, Gretchen Egolf, and Mark H. Dold, directed by Julianne Boyd. Shakespeare’s witty war of words between Beatrice (Egolf) and Benedick (Innvar) is set in romantic 1930s Italy. 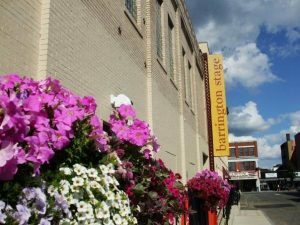 Boyd-Quinson Mainstage, 30 Union St., Pittsfield. Performances Tuesday and Wednesday at 7pm, Thursday-Saturday at 8pm, Wednesday and Friday matinees at 2pm (excluding 8/9), Sunday at 5pm. Press Opening: Sunday, August 11 at 5pm. Tickets: $20-$58. Performances August 8-10 tickets are $15/$20. Seniors: $39 & $34 all matinees. Youth ages 6-18, tickets $15 all performances (subject to availability). August 9 – 10. Mr. Finn and his All-Star Songwriters, Take #2. August 9 at 10:30pm and August 10 at 8pm. Tickets are $20, general admission. Mr. Finn’s Cabaret at the Sydelle and Lee Blatt Performing Arts Center, 36 Linden Street, Pittsfield. August 12. For Colored Girls Who Have Considered Suicide When the Rainbow is Enuf by Ntozake Shange. Part of the 2013 WordXWord Festival, 7pm. Staged reading directed by Dawn Monique Williams. Boyd-Quinson Mainstage, 30 Union St., Pittsfield. Tickets are $15, reserved seating. August 13. Post-Show Discussion: MUCH ADO ABOUT NOTHING. Boyd-Quinson Mainstage, 30 Union Street, Pittsfield. Following the Tuesday 7pm performance. August 15 – September 29. SCOTT AND HEM IN THE GARDEN OF ALLAH. Written and directed by Mark St. Germain. A world premiere play about the artistic and romantic rivalry between F. Scott Fitzgerald and Ernest Hemingway. St. Germain Stage at the Sydelle and Lee Blatt Performing Arts Center, 36 Linden Street, Pittsfield. Performances August 15 – September 1: Tuesday-Saturday at 7:30pm, Saturday at 4pm (excluding August 17), Sunday at 3pm (additional matinee on Thursday, August 29 at 4pm). Performances September 6-29: Wednesday-Saturday at 7:30pm, Saturday at 4pm and Sunday at 3pm. Press Opening: Wednesday, August 21 at 7:30pm. Tickets: $40-$46. Seniors: $32 all matinees. Low priced previews August 15 & 16 are $15. Youth ages 6-18, tickets $15 all performances (subject to availability). August 17 – 18. Musical Theatre Apprentices: 10-Minute Musicals. August 17 at 10:30pm and August 18 at 8pm. Tickets are $10, general admission. Mr. Finn’s Cabaret at the Sydelle and Lee Blatt Performing Arts Center, 36 Linden Street, Pittsfield. August 19. For Colored Girls Who Have Considered Suicide When the Rainbow is Enuf by Ntozake Shange. Westside Community Arts Project. 7pm, Staged reading directed by Dawn Monique Williams. St. Germain Stage the Sydelle and Lee Blatt Performing Arts Center, 36 Linden Street, Pittsfield. FREE, but reservations are strongly recommended. August 20. Post-Show Discussion: SCOTT AND HEM IN THE GARDEN OF ALLAH. St. Germain Stage the Sydelle and Lee Blatt Performing Arts Center, 36 Linden Street, Pittsfield. Following the Tuesday 7:30pm performance. August 25. Sam Salmond. Tickets $20, general admission. Mr. Finn’s Cabaret at the Sydelle and Lee Blatt Performing Arts Center, 36 Linden Street, Pittsfield. Narrated by Tony Award-winner William Finn. Boyd-Quinson Mainstage, 30 Union Street, Pittsfield. A BSC Labor Day weekend tradition. Performances Friday and Saturday at 8pm. Tickets: $25-$35. September 1. Staged Reading DANCING LESSONS by Mark St. Germain directed by Julianne Boyd at 7pm. A new play from the author of Freud’s Last Session, The Best of Enemies and Dr. Ruth, All the Way, Dancing Lessons centers on a high-functioning young man with Asperger’s Syndrome as he tries to navigate a relationship with a Broadway dancer, now sidelined with injuries. Tickets are $15, reserved seating. Boyd-Quinson Mainstage, 30 Union Street, Pittsfield. September 21 – 22. LOVE & TAKE OUT with MICHELE BROURMAN. September 21 at 9:30pm and September 22 at 7:30pm. Tickets are $25, general admission. Mr. Finn’s Cabaret at the Sydelle and Lee Blatt Performing Arts Center, 36 Linden Street, Pittsfield. Boyd-Quinson Mainstage, 30 Union Street, Pittsfield. A co-production with Dorset Theatre Festival. Performances Thursday at 7pm, Friday and Saturday at 8pm, Sunday at 3pm. Two added performances: Saturday October 5 at 2pm and Sunday, October 13 at 7pm. Press Opening: Sunday, October 7 at 3pm. Tickets: $20-$40. Low-priced previews on September 26 – 28 are $15/$20. Seniors: $38 all matinees. Youth 18 and under $15 all performances. Additional matinees for student groups are scheduled. Contact Group Services at 413-236-8888 for more information. October 3. Post-Show Discussion CLYBOURNE PARK. Boyd-Quinson Mainstage, 30 Union Street, Pittsfield. Following the Thursday 7pm performance.